Another Day In Pensacola: I got featured on WIP Wednesday! I haven't worked on that particular WIP since last week. I have so many others going on! 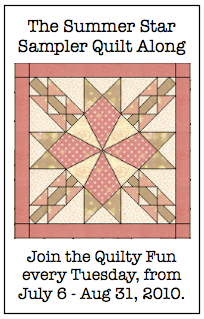 I am making blocks for the Summer Quilt Along's Star Sampler at A Quilty Kind of Girl's blog using up the last (sniff, sigh!) of my Sandi Henderson Farmers Market pink and aqua pieces plus some other stash pieces. Since it is all pinks and reds, greens and aquas with white, I am thinking that it will become a donation to a breast cancer treatment center. My very first Block of the Month Club from The Fat Quarter Shop is about to send me block #3, and I just got around to block #1! I need to get a move on! 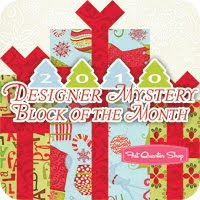 It uses Kate Spain's new Christmas line and so many of my favorite designers made a block pattern for each month, I just had to sign up! The logo pictured here is Block 1. I think you can still sign up for this if you are tempted. Another project rumbling around in my brain is what kind of backing to make with a bunch of flying geese and either flannel or cotton to make my honey his own Winter sofa quilt. After saving a quilt top from disaster it is now ready to be backed and quilted. I have not made him his very own quilt yet, and I feel a little bad about that. 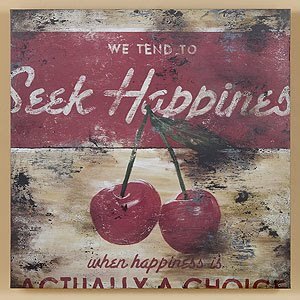 Not that I don't have good intentions! And we do sleep under quilts I made every night. 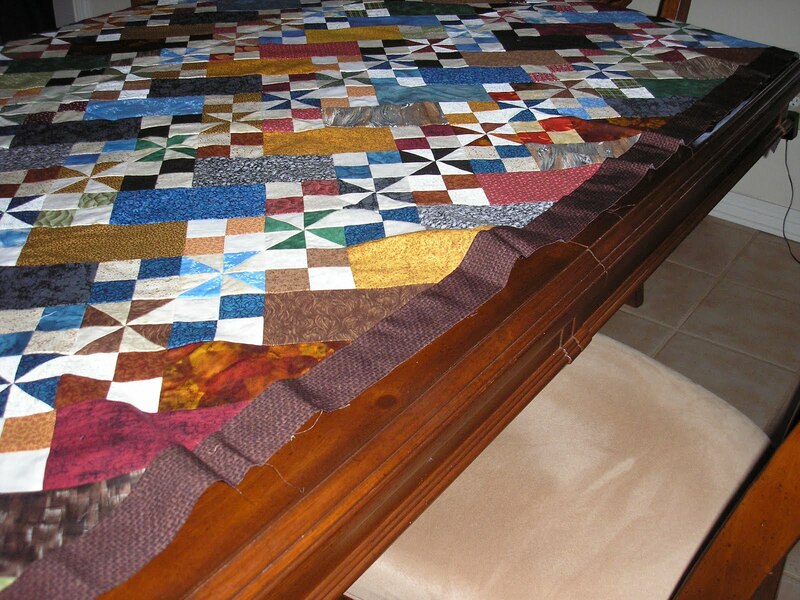 This quilt top was started when it was a new mystery quilt. A major stash buster in the Fall of 2008. Made tons of pinwheels and 4 patches and then put it away. Got it back out when my daughter was 5 or 6 months pregnant. Put away again. Now the baby is almost 17 months old. Some things need to age. Or in my case, be away from me while I freak out and calm down. This can sometimes take months, you know? A little humility is good for everyone, right? Here is Old Tobacco Roads from quiltville.com. and what I had to deal with. It is supposed to have flying geese as a border all the way around after the brown border you see here. I could put my hand under some of these waves. I tried steaming, starching...nothing fixed it. It was hopeless. I ended up stitching straight up through those pinwheels to stabilize it and cutting off the four patches and bricks and border. ON BOTH SIDES. I added a dark blue on blue Civil War era print 6 inch border after that, and it is still a decent size for a sofa quilt, so I think I am over being mad about this. My quilting motto is now "No More Bias Quilts." There are plenty of other pretty things to make. I'll leave the bias alone.